UPDATE: Now we've driven it! 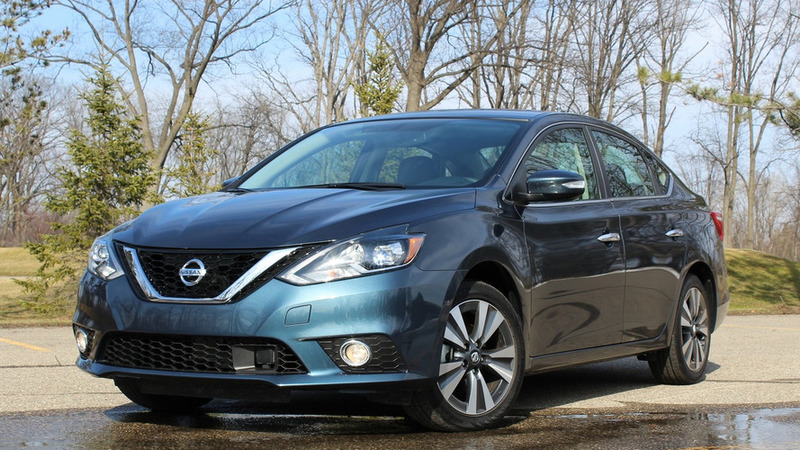 Click here to read our 2017 Nissan Sentra Nismo review. Nissan’s quest to make its Sentra sportier wasn’t finished with the introduction of the SR Turbo trim level. At this year’s Los Angeles Auto Show, the compact sedan gets even more aggressive thanks to the addition of the new Sentra Nismo variant. It’s the fourth Nismo model in the U.S., joining the Juke, 370Z, and GT-R. Despite the Nismo suffix, though, upgrades for this Sentra only slightly improve upon the SR Turbo variant we already drove earlier this year. As in that model, motivation comes from a 1.6-liter turbocharged inline-four, with 188 horsepower and 177 pound-feet of torque; buyers can pick between a six-speed manual and a continuously variable transmission. Nor are there any braking upgrades, with the SR Turbo and Nismo both using 11.7-inch front disc brakes as compared to 11.0-inch ones on other Sentra trim levels. Instead, the big parts of what make the 2017 Nissan Sentra Nismo a Nismo revolve around handling tweaks. The car’s ride height has been lowered by 0.4 inch and its dampers have all been retuned to provide stiffer handling than the SR Turbo. The stock 215/45R18 Michelin Pilot Sport tires ride on the first 18-inch wheels ever offered on a Sentra from the factory, while Bridgestone Potenza RE-71R summer tires are available as a dealer option. The upgraded body kit also plays a role in handling, as the larger new rear spoiler and rear fascia help reduce lift by 30 percent. The electric power steering has also been revised for heavier, sportier feeling than even on the SR Turbo, and there’s extra chassis bracing in the cowl and parcel shelf to keep the Sentra stiffer. Nissan says the Sentra Nismo will ring in below $25,000, or only a little pricier than the existing Sentra SR Turbo. Check back soon for our first drive of the Sentra Nismo. The 2017 Sentra NISMO is the latest in a long line of compact Nissan performance sedans going back nearly 50 years to the Datsun 510 and the original Sentra SE-R. The new, first- ever Sentra NISMO is also the first mainstream U.S. Nissan model to offer motorsports- inspired NISMO factory-tuned performance. It joins the GT-R NISMO, 370Z NISMO, JUKE NISMO and JUKE NISMO RS in the 2017 Nissan lineup. The 2017 Sentra NISMO model’s comprehensive transformation from everyday sedan to a highly personal performance machine includes aggressive exterior treatment, performance- oriented interior and unique suspension tuning. At the heart of any NISMO-badged production vehicle is the engine, such as the GT-R NISMO’s 600-horsepower 3.8-liter V6. For the new Sentra NISMO, the engineers started with a 1.6-liter turbocharged 4-cylinder engine that fit perfectly within the aerodynamically aggressive Sentra NISMO bodywork. More than just an engine transplant, however, the motorsports-inspired transformation from practical sedan to a vehicle worthy of the NISMO badge involved a precisely balanced tuning of body, interior, chassis, suspension, steering and powertrain. 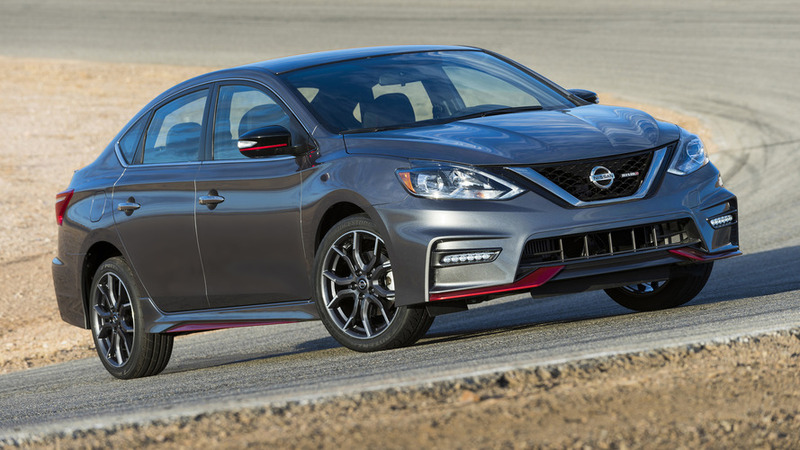 The first thing most people will notice about the new Sentra NISMO is its highly aggressive presence, which goes even above the sporty Sentra SR and Sentra SR Turbo grades. Applying the NISMO philosophy of “totally balanced tuning for high speed driving, to provide ultimate driving pleasure,” the Sentra NISMO aerodynamic design focus was on realizing zero lift without harming overall coefficient of drag (Cd). Therefore Sentra NISMO offers the same 0.29 Cd as standard Sentra models, but features a 30 percent reduction in lift force. While most of the reduction is provided by the unique NISMO rear spoiler, the revised rear bumper design also contributes. Beyond the aerodynamic enhancements, the overall exterior appearance is instantly recognized as pure NISMO with its signature “layered double wing” design in the front, side and rear lower body panels. A thin red stripe accents the lower panels. In front, a unique front fascia dominates, along with standard LED Daytime Running Lights, NISMO dark chrome V-Motion grille and NISMO badge. Other styling features include unique side sills, NISMO rear fascia and spoiler, NISMO exhaust finisher, dark chrome door handles and trunk finisher, rear NISMO badge and black NISMO outside mirror caps with integrated turn signals and NISMO red stripe. Helping give Sentra NISMO its aggressive stance, while also helping enhance handling performance, are 18-inch NISMO 10-spoke aluminum-alloy wheels mounted with specially selected 215/45R18 Michelin Pilot Sport all-season tires. Ride height has also been reduced by 0.4-inch. The 2017 Sentra NISMO is offered in four exterior colors – Brilliant Silver, Gun Metallic, Super Black and Aspen White. Inside, the Sentra NISMO interior is designed to support exciting driving – starting with unique NISMO front seats with logo and additional side bolstering. The rear seats feature unique cloth material with red stitching. Red motorsports-inspired accents are found throughout the interior, including on the unique Alcantara and leather-wrapped steering wheel, the push button start with red start ring, NISMO meter cluster with red tachometer, leather shifter knob and NISMO embroidered carpets. A dark headliner and NISMO logo on the instrument panel complete the special interior treatment. Just one interior color is offered, Charcoal with red accents. “The NISMO interior treatment adds a high level of driving support and sporty style without compromising the everyday drivability,” said Bunce. 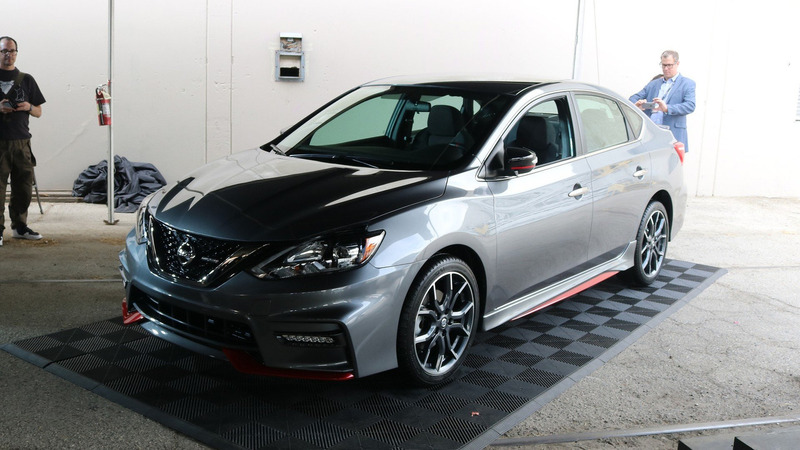 Along with the long list of unique NISMO features, the 2017 Sentra NISMO also offers a 5.0- inch Advanced Drive-AssistTM Display (ADAD) located between the tachometer and speedometer, soft-touch instrument panel, sliding armrest, Nissan Intelligent Key® keyless entry, RearView Monitor, power windows with driver’s one-touch auto up/down with auto reverse, power door locks with auto-locking feature, remote keyless entry and remote trunk and fuel-filler door releases. FreeTM Voice Recognition and smartphone integration for iPhone® and Android phones are also standard. The optional NISMO Premium Package adds a Bose® Premium audio system with eight speakers. Also offered with the NISMO Premium Package is NissanConnectSM with Navigation and Mobile Apps – with 5.8-inch color touch-screen display, Nissan Voice Recognition for audio and navigation, SiriusXM® Traffic and SiriusXM® Travel Link® (SiriusXM® subscription required, sold separately) and NissanConnect Mobile Apps. As a pure factory tuned performance vehicle, Sentra NISMO offers buyers something aftermarket tuners can’t – a balanced approach that goes deep under the skin of the vehicle with modifications to the structural integrity. Starting with the solid Sentra body, which packs ample interior roominess in a compact-size exterior, the Sentra NISMO body structure is enhanced with a number of factory tuned body reinforcements. The cowl is thicker and vehicle floor and rear parcel shelf are reinforced to stiffen the body structure, improving responsiveness to steering inputs – helping provide an enhanced platform for the new engine and NISMO-tuned suspension. The power side of the equation comes in the form of Sentra NISMO’s new 1.6-liter Direct Injection Gasoline (DIG) turbocharged engine, which is shared with the new-for-2017 Sentra SR Turbo model. Rated at 188 horsepower at 5,600 RPM and 177 lb-ft of torque at 1,600 - 5,200 RPM, the 16-valve DOHC aluminum-alloy inline 4-cylinder engine includes a 10.5:1 compression ratio, Continuously Variable Valve Timing Control System (CVTCS), spray-coated and mirror-finish cylinder bores, a variable pressure oil pump and a low- pressure EGR system, which helps lower exhaust gas temperature and improve knock sensitivity. The Continuously Variable Valve Timing Control System (CVTCS) includes an intermediate lock function on the intake side, while the use of spray-coated and mirror-finish cylinder bores (versus the iron liners) provides an estimated 12 percent reduction in internal friction, which also improves anti-knock performance and reduces engine weight. The DIG system helps improve combustion, enhancing power, torque, economy and emissions, while the use of the turbocharger and intercooler helps boost power. The variable timing control for both intake and exhaust cycles improves low-end engine response. The engine is matched with choice of a 6-speed manual transmission, with gear ratios selected to take maximum advantage of the engine’s powerband and torque curve, or an advanced, tuned Xtronic transmission. For buyers choosing the Xtronic transmission, it has been specially tuned to match the engine’s performance. Acceleration feel is enhanced with the Xtronic’s D-mode step shift program, giving a more linear acceleration feeling without holding a high rpm constant, letting rpms build as speed builds. Delivering on the handling aspect of the Sentra NISMO, the engineering team sought to provide a noticeable improvement even beyond the enhanced performance of the new Sentra SR Turbo. Five key areas were designated to meet the NISMO standards – handling response, grip, steering feel, body control and ride/handling balance. The NISMO-tuned independent strut front/rear torsion beam suspension goes beyond the SR Turbo’s enhanced design (versus non-turbo Sentra grades) by adopting monotube rear dampers and unique tuning of the front springs and struts. The lightweight monotube shock design features separate oil and gas chambers and high-pressure gas charge to help provide quicker response to damper stroke and velocity changes. Faster damper response means faster reaction to changing steering or road conditions. In addition, the NISMO tuning of the springs and struts helps improve body control (roll and pitch) for higher demand cornering. Steering effort of the Electric Power Steering (EPS) system has also been specially tuned to provide a “NISMO feel.” The special dialing in of the effort/response relationship helps provide good highway and winding road feedback, precise on-center definition without overly high driver effort and a linear, direct steering feel at turn-in. Also contributing to the overall handling performance is the unique Sentra NISMO wheel and tire combination. Utilizing NISMO 18-inch aluminum-alloy wheels mounted with newly developed 215/45ZR18 Michelin Pilot Sport all-season tires, cornering power and grip levels are improved, even over the new Sentra SR Turbo. It is the first time 18-inch wheels and tires have been offered on a Sentra. For customers seeking maximum grip, high- performance 215/45WR18 Bridgestone Potenza RE-71R summer tires are available through Nissan dealers. Like the SR Turbo, the steering system includes a larger steering motor and revised electronic mapping to provide reduced effort at parking and low speeds. The Sentra NISMO also utilizes a 4-wheel disc brake system with 11.7-inch vent front discs and 11.5-inch solid rear discs. Like all 2017 Sentra models, Sentra NISMO offers a long list of standard safety and security features – including the Nissan Advanced Air Bag System (AABS) with dual-stage supplemental front air bags with seat belt and occupant classification sensors; front seat- mounted side impact supplemental air bags; roof-mounted curtain side impact supplemental air bags with rollover sensor for front and rear-seat outboard occupant head protection; 3- point front and rear seatbelts, front seat belts with pre-tensioners and load limiters and adjustable upper anchors; and LATCH System (Lower Anchors and Tethers for CHildren). Also included are child safety rear door locks; Zone Body construction featuring front and rear crumple zones and occupant zone; Nissan Immobilizer system and anti-theft alarm system; and Tire Pressure Monitoring System (TPMS) with position monitoring and available Easy Fill Tire Alert system. Just one factory option is available with the Sentra NISMO: the NISMO Premium Package with NissanConnect with Navigation and Mobile Apps, 5.8-inch color touch-screen display, Nissan Voice Recognition for audio and navigation, SiriusXM® Traffic and SiriusXM® Travel Link® (SiriusXM® subscription required, sold separately), NissanConnect with Mobile Apps, and Bose® Premium Audio system with 8 speakers. In addition to the new Sentra NISMO, the 2017 Sentra is offered in five other grade levels: Sentra S (6MT and Xtronic), SV (Xtronic), SR (Xtronic), SR Turbo (6MT and Xtronic) and SL (Xtronic). For full information, please visit NissanNews.com. The 2017 Sentra NISMO is assembled in Aguascalientes, Mexico, with the engine assembled in Yokohama, Japan.